Born in 1920, he began flying in 1936, and as noted above, making exhibition parachute jumps at local air shows. He enlisted in the Navy in 1941, immediately after Pearl Harbor, and served aboard the USS Badoeng Strait. As a parachute rigger he helped develop emergency jump equipment. Following his discharge, Jim worked for a commercial parachute service. His editor later relented on the jumping edict (Jim had never quit) and whatever his job, he never quit writing. In 1948 he wrote the first of his aviation books, Parachuting for Sport, to be followed by two more, The Parachute, From Balloons to Skydiving and Stunt Flying in the Movies. After a brief stint with Eastern Air Lines, he managed publicity for the 1950 Miami All American Air Maneuvers, sponsored by American Airmotive. From 1951 to 1955, Jim was Assistant to the President of Hawthorne School of Aeronautics, serving as Coordinator of Training. His communications and public relations program developed originally for Hawthorne became models for the Air Training Command. In response to a series of air show crashes where spectators were killed, the CAA threatened to ban all aerial demonstrations. Based on Greenwood’s recommendations, the Administration issued new criteria for air shows – still being used today. He organized and managed Arnold Palmer’s record setting flight around the world in 1976 and was instrumental in assisting Neil Armstrong’s flight that set five world records in 1979. Among other writings, he published a volume dealing with his and his wife’s experience with her Alzheimer’s Disease, and was still working with Arizona State on an Alzheimer’s project when he died. In an interview with Jim Davis in 2009, Greenwood admitted to what he called a “brief bridge flying career.” Shortly after being mustered out of the Navy in 1946, he resumed his civilian flying out of Beacon Field, Alexandria, Virginia. One day while flying a Kinner engined Fleet biplane, Jim said, “I had this impulse to do something different…I hadn’t flown under a bridge since St. Louis.” Putting the Fleet into a dive, he took aim at the old 14th Street Bridge over the Potomac River. Swooping under it, he recalled he looked back at the bridge. “I certainly stopped a lot of traffic,” he said. In what must have been his last public appearance, Jim Greenwood was on hand two years ago to greet artist Peter Westacott when he visited FASF and Columbus to greet the crowd and to chat with old friends and new. We were fortunate to know him; we shall not see his like again. Jim Davis, Washington DC and Columbus: In a masterpiece of understatement, Jim’s business card reads: Retired Government Clerk. Actually, he worked in almost every area of the FAA, including Tower Controller, and when he retired was the chief of the FAA Rapid Response Team. His responsibilities included responding to every major crisis and then reporting to the President and to the FAA Administrator. He is an active pilot and an aviation historian. Ken Emery, Columbus: Ken retired from a career as a cultural resource archeologist to a part-time job in a fire watch tower near Globe, Arizona. He presently serves on the Village of Columbus Historic Preservation Commission. His hobbies include deep research on local history and he is an active recruiter for the Foundation. His profiles of the First Aero Squadron appear in the monthly Desert Exposure as well as these pages. Gene Valdes, Columbus: Retired Personnel Director, NM Human Services Dept. and a former member of the NM State Personnel Board. Gene has served as President of the Board of Directors of United Way of Santa Fe County; Vice President of Fairview Historical Cemetery, Santa Fe; and is a Navy Veteran whose hobbies include New Mexico history and genealogy. Gene is a board member of the Columbus Historical Society and an officer of the local American Legion Post. He is immediate Past President of FASF. Ira A. Rader was born in Mayten, California on July 30, 1887. He attended the University of California Berkley for one year then entered West Point. He graduated in 1911 with a B.S. in engineering and was assigned to the 19th Infantry Regiment in the Philippines. A year later, still in the Philippines, he transferred to the 24th Infantry. Lt. Rader returned to the U.S. on leave in 1914 and volunteered for the Army Air Service. He started training at North Island, San Diego in December. He soloed in May, 1915, received his F.A.I. certificate in June and his J.M.A. rating in July and was assigned to the First Aero Squadron at Fort Sill, OK. He moved with the squadron to San Antonio, then on to Columbus for the Punitive Expedition into Mexico. Between March 19 and April 14, 1916, Rader served competently and uneventfully with the squadron scouting and carrying dispatches. But on the 14th, while delivering dispatches to the 11th cavalry, he landed in country too rough for his Jenny, #52, to handle. He was 100 miles from the nearest U.S. base and the plane was so badly damaged he was forced to leave it. The cavalry graciously loaned him a sick mule which he rode at the end of the column, the latest in the long line of camp followers. 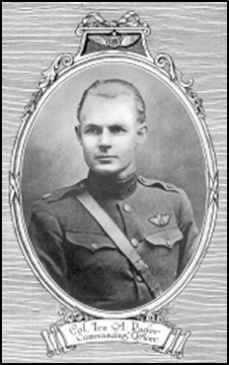 Rader, now a Captain, was ordered to Mineola, NY on September 19th, 1916 to serve with the Signal Corps Aviation School. At this time, most of the experienced pilots of the First Aero Squadron were being dispersed to various bases to serve in training and organizational capacities. This assignment lasted until July 20, 1917 when he was promoted and became the Departmental Aeronautical Officer, Central Dept., Chicago, IL. In October he was ordered to France and arrived there on November 12, 1917. Major Rader was attached to Headquarters, Chief of Air Service; Paris, briefly, then was given command of the Seventh Aviation Instruction Center at Clermont-Ferrand from November 27th until September 11, 1918. On the 13th, he was promoted to Lt. Colonel and joined the First Bombardment Group at Amanty. He flew on missions over the lines during the St. Mihiel and Champagne campaigns. He sailed to the U.S. on October 9th as Special Representative of Training Dept., Air Service, and on November 4th took command of Ellington Field, the largest aviation training facility in the nation. During the inter-war years, Ira Rader served in a number of capacities and attended four army schools. He became a temporary Colonel in 1936 and Colonel permanently on June 1 of 1940. In 1939, he commanded Barksdale Field near Shrevesport, LA, then the largest airfield in the world. In 2007, a group of aviation enthusiasts and other interested citizens met at the library in the border village of Columbus, New Mexico to discuss what might be done to protect a unique but also endangered national historic treasure: the site of the original landing field where the U.S. first Aero Squadron was deployed in response to Pancho Villa’s infamous raid on Columbus on March 9, 1916. Thanks to generous donors, the First Aero Squadron Foundation now owns 60 acres of land encompassing most of the original 1916 airstrip. We are planning to restore the original flight line, erect a memorial to those early aviation pioneers, and, eventually, establish a museum dedicated to pre-World War II aviation We have already surveyed the land for an airstrip to accommodate present-day aviation enthusiasts and will be grading a runway soon. With your continued support, we are definitely on our way to achieving those goals. Traditionally, charitable organizations solicit contributions as the year end approaches. We are no different. If you have a few dollars left over after you remember those other good causes, keep us in mind, OK? We need your help and remember your contributions are tax deductible. Thanks! Enjoy the upcoming holidays and best wishes for a happy, healthy and prosperous New Year! The First Aero Squadron is a 501(c)(3) organization run by its members through a board of trustees. Please mark your ballot and mail it back. We must have your ballot to keep functioning. Thank you!